Swami Vivekananda (January 12, 1863–July 4, 1902), born Narendranath Dutta is the chief disciple of the 19th century mystic Sri Ramakrishna Paramahamsa and the founder of Ramakrishna Mission. He is considered a key figure in the introduction of Vedanta and Yoga in Europe and America and is also credited with raising interfaith awareness, bringing Hinduism to the status of a world religion during the end of the 19th century. 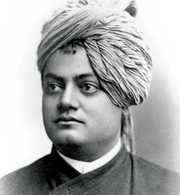 Vivekananda is considered to be a major force in the revival of Hinduism in modern India. He is best known for his inspiring speech beginning with "sisters and brothers of America", through which he introduced Hinduism at the Parliament of the World's Religions at Chicago in 1893. Swami Vivekananda is currently considered a "single author." If one or more works are by a distinct, homonymous authors, go ahead and split the author. Swami Vivekananda is composed of 21 names. You can examine and separate out names.